P.S. Sorry I’m a day late this week. While this was an exciting time for these families, this had to be an especially difficult time of testing for Mary. She was a virgin, who returned home in her second trimester. She would have started to show by this time, which could cause speculation and persecution to those who didn’t understand the mission she was given and God’s miraculous hand in it all. She exercised courageous faith in two ways. First, she believed the angel’s Word. She believed that what he said, would come to be, and so she hurried off to share the news with Elisabeth. And second, she returned home after three months, a pregnant single woman, with a promise from God. What are the similarities between Mary and Elisabeth’s pregnancies, and what are some of the differences? Why were Zechariah and Elizabeth childless? Elisabeth couldn’t conceive and they were both old. What do you know about Zechariah’s lineage? Where else in the Bible do we find the angel Gabrielle mentioned? In Daniel chapter 8, the angel Gabriel helps Daniel interpret his dream. How far along was Elizabeth’s pregnancy when the angel went to see Mary? She was six months along. Where did Mary go after the angel left her? She went to visit Elisabeth. How long did Mary stay before she went home? She stayed with Elisabeth for three months. To go before Jesus and prepare people’s hearts for Him. Here we see Mary and Joseph fulfilling the laws of the Old Testament regarding purification and circumcision. Jesus came to fulfil the law by becoming the ultimate sacrifice. At this point in time however, they were still under Levitical law. While Mary and Joseph knew that Jesus was the Son of God, that His birth was miraculous, and that He was born for a purpose. They only knew in part how God’s plan would unfold. They learned as they watched Him grow from a child to a man of great understanding and power. Just like anyone else who knew Him during His life, they couldn’t possibly understand the path that God had set before Him. Also read Matthew 1:18-25. 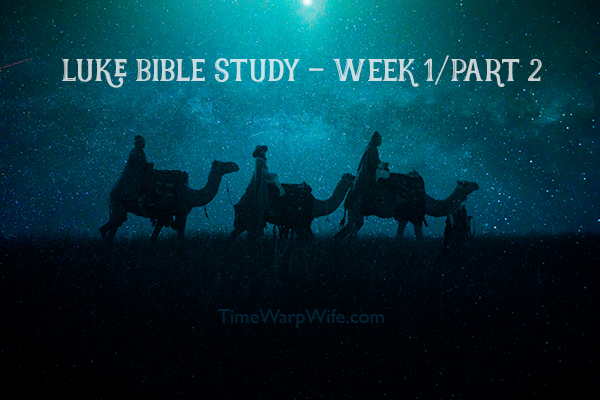 What does it tell us about Mary and Joseph’s marriage? They were married while she was with child, but they did not consummate the marriage until after His birth. What is the significance of Joseph being in the line of David? The Jewish people kept tight records of their lineage. One reason being that the line of Aaron was consecrated to the priesthood, the other was that they were waiting for the coming Messiah who was from the royal line of David. Luke mentions David three times in chapter one, three times in chapter two, and we’ll see the lineage in full in chapter three. This royal lineage was significant in establishing Jesus Christ as an heir to the throne. If one were to assert himself as a king of the Jews, He would first have to prove that He was from the line of David. What was the shepherds’ initial reaction when they saw the angel? What did the shepherds do after the angels left them? They praised God, and then they hurried to see the prophecy fulfilled with their own eyes. When did Mary and Joseph officially name Jesus? At the time of His circumcision, eight days after birth. Why is Exodus 13:2 &12 significant to this chapter? In accordance with Exodus 13:2&12, Mary and Joseph were to consecrate their firstborn to the Lord, and so they brought Jesus to Jerusalem after her days of purification were done. Why did they bring a pair of doves and a 2 pigeons to the ceremony? See Leviticus 12:6-8. According to the Levitical law, when the days of purification were over for a woman, she was to bring a burnt offering for the Lord to the priest. They were instructed to bring a lamb, and a turtledove or a pigeon. However, if they couldn’t bring a lamb, then she was to bring two turtledoves, or two young pigeons; the one for the burnt offering, and the other for a sin offering. A priest would then make atonement for her, and declare the woman clean. What do we learn about Anna? She was an 84-year-old widow who lived in the temple, and had been there for many years. She never left the temple, we’re told. She fasted and prayed, worshipping God day and night. She prophesied about Jesus at the purification ceremony, giving hope to all who were looking forward to the redemption of Jerusalem. What celebration caused the family to travel to Jerusalem year after year? The festival of the Passover, which lasted for seven days. What was Jesus doing in the temple at the young age of 12? He was listening to the teachers in the temple, asking questions and offering insightful answers. What struck me as interesting in this chapter was John’s passion for truth. Bold and faithful like the prophet Elijah, John preached a message of obedience, compassion, repentance, and truth. While many were focused on the outward appearance of righteousness according to the law of Moses, John was preaching an inward change. He was sent to prepare the way of the coming of the Messiah. In preparing the way, he was preparing their hearts. Who was the governor of Judah? And who was the tetrarch of Galilee? Pontius Pilate was the governor of Judea, and Herod was the tetrarch of Galilee. What does John mean when he says that God is able to raise Abraham’s children from the stones? What can we learn from that? Our privileges, whether they be the family we’re born into, or the awesome church that we attend can’t save us. Faith without works is dead. God doesn’t need us to fill up church pews—He can very well raise up others to do that. What He wants is repentance, and to see the fruit of that repentance at work in our lives. What does verse nine mean? Many of the people at that time were descendants of Abraham. They assumed that their lineage was enough to save them, regardless of the sin they had in their hearts. John is pointing out the importance of repentance, and the fruit of a righteous life. Why did Herod put John in prison? Herod decided that he wanted his brother’s wife Herodias. He divorced his wife so that the two of them could be married. John rebuked Herod for this and for the other wicked things he had done, thus angering Herod. Herod put John in prison where he was later beheaded by request of Salome who is said to be the daughter of Herodias. Why is Joseph’s lineage relevant to the life of Christ? What’s interesting about this genealogy is that verse 23 tells us that “Heli” was the father of Joseph. The book of Matthew chapter one on the other hand, says that “Jacob” was the father of Joseph, the husband of Mary. Scholars therefore believe that the account in Luke is Mary’s lineage, Joseph being the son [by marriage] of Heli (also called Eli). Both genealogies prove that Jesus was of the house of David. God doesn’t leave us when we’re tempted. He allows us to enter wilderness places in order to prepare us for His kingdom. Our lives go through times of testing and trials. During those times of despair, God’s grace is upon us. He never forsakes us, but He does allow us to walk through wilderness places in order to prepare us for those things that lie ahead. I’m reminded of a study we had a few months back, where Ishmael and Hagar were sent off to the wilderness with nothing but a bottle of water and some bread. After reading this story so many times and missing the point, I finally realized the gift that Hagaar was handed. Not only was she sent off with a promise for Ishmael, but they were also both given an opportunity to grow. Why would the Spirit lead Jesus into the wilderness? And why was this time of testing important? Anytime that we overcome temptation, we’re strengthened, we exercise patience, and we grow in faith. This time of strengthening and restoration was important for Jesus as He was stepping into ministry, and would soon be facing the greatest trial of His life. Jesus was tempted in three ways, what were they? Pride – Jesus had the opportunity to prove His power, but for all the wrong reasons. Instead of exercising His pride, He humbly chose a better path. Lust for this world – Satan offered Jesus power over all of the kingdoms of this world if Jesus would only worship him. Countless people give into temptation daily, turning their back on the Lord to follow the lust of this world. They trade an eternal promise for a momentary high. Jesus rebuked Satan three times. What was the common thread in each of the three rebuttals? Where was Jesus brought up? He was raised in Nazareth. Why were the people in the synagogue angry with Jesus? First of all, He was comparing Himself to Elijah, and how Elijah was sent to heal the brokenhearted, deliver the captives, and heal the blind. This tickled their ears. They had been waiting for someone to deliver them from the hands of the Romans for years. Jesus pointed out however, that during the 3 ½ year famine, Elijah only healed one widow and one leper. The people were angry because they sensed that Jesus was directing this message at them. The lowest in society (a widow and a leper) received more than they could hope to receive. What are some of the miracles that Jesus performed in this chapter? He healed Simon’s mother, healed many that were sick and cast out demons. How did the people in Nazareth differ from those in Capernaum? Unlike the people of Nazareth, the people of Capernaum were receptive and impressed with this speaking. What really stood out to me today was Simon’s humble attitude. I got to thinking about the many times great things have happened to me, and the countless days I’ve been distracted by the gift instead of turning my heart to the Giver. How many times have my nets been full to breaking? More times than I can count. I pray that God will humble me like Simon who fell down upon His knees in worship and in thanks. Everything I have is grace. Everything I am is His. What was Simon Peter’s reaction to the miracle he witnessed at sea that day? Others may have acted a different way. Many would have been proud of their catch, distracted by the abundance of fish, and ready to bask in the limelight, but Peter was humbled before Jesus. This is a good lesson for all of us to humble ourselves before God when we’re blessed by His goodness. How were James and John connected to Simon? They were fellow fishermen and partners with Simon. In verse 14, Jesus told the man not to tell anyone other than the priest about this miracle. Why do you think that is? This was often the case, but not always. Later in Luke chapter 8 we’ll see an occasion where Jesus instructed a man to share the good news of his miracle. And so it wasn’t that Jesus wanted to keep this a secret necessarily, but that it wasn’t the proper time. What we need to understand is that God’s wisdom exceeds ours. His timing is vital whether we understand it or not. Why did Jesus withdraw from the crowds? In order to pray and commune with the Lord. Why did Jesus eat with sinners and tax collectors? He didn’t come to rub shoulders with self-righteous men. He came to seek out sinners and to preach the gospel to all that would hear. What does the parable of the wineskins mean at the end of this chapter? The Scribes and the Pharisees were troubled that Jesus was dining with Levi. Levi was a tax collector, which in those days was looked down upon. The old wineskins were liken to the Scribes and the Pharisees who rejected the message of Christ for the stringent ceremonies they had lived by for so many years. The new wine was the good news of salvation that Jesus brought to the world. He wanted to preach this message to open hearts that were receptive to His teaching. Jesus was talking about a new covenant that extended mercy and grace to the sinner. As I read this chapter, I was reminded of how important it is to guard my heart. What comes out of my mouth is nurtured first within the heart. If I take pleasure in things that pull me away from the Lord, my attitude and actions will soon follow suit. A good tree brings forth good fruit. But if that tree isn’t rooted in truth and nurtured by the will of God, it’s roots will be shallow at best. Why were the Pharisees and the teachers of the law angry with Jesus? Can you find the story in the Old Testament that Jesus is referring to where David ate the consecrated bread? Verse 13 says that Jesus chose 12 disciples who he also designated as apostles. What is the difference between the two designations? Jesus originally chose 12, one of them (Judas) was later replaced in Acts by Matthias. Paul is also considered an apostle (although not one of the 12), because he was specifically called by God with a mission. How are we instructed to treat our enemies? We should love our enemies and do good to the people that hate us. We’re to pray for the people that use us, and give to those who ask of us. It’s easy to love those who love us, but we’re commanded to also love those who are difficult. We must learn from God who offers mercy to the sinner. What do we learn about the heart in this chapter? That the attitude within our heart will dictate our actions and words. What does Jesus say about those who hear God’s word, but ignore it? They aren’t building on a strong foundation, and they will collapse under pressure. Unfortunately, many who do, walk away from their faith, which is why it’s important to be rooted and grounded in Christ. Thank you my online teacher,I have been learning a lot with your bible studies you are a blessing in my live your testimony is just like mine.I couldn’t answered some questions, but you gave me the light. (from the book of Luke)Happy weekend . I just want to thank you for your time and dedications to these bible studies. This is my third one that I have participated in. I grew up in an environment that taught me to pray and believe, but struggled with studying the bible. This has helped me greatly. I try to join bible studies at my church, but work and raising a child makes it difficult, another reason I enjoy participating in this. I just want to thank you for the time you put into these studies, I’ve been doing the last couple. I’m especially enjoying this study on Luke as we approach the Christmas season. This is helping me to keep my focus on Jesus as it should be. And I like your questions as they cause me to think about what I’m reading. You are such a blessing! I love your studies. I don’t do well just reading my Bible and fully understanding it, but being able to read your notes and answers (I actually write them all down) it helps me break it all down and really get what I’m reading. This is all new learning to me…sad but true…but I am truly enjoying it all. Thank you so much! I too, want to thank you for all of your hard work that you put into these studies. I have ventured away from other reading plans because I did not feel challenged by them. However, this particular study stirred up questions of my own and a lot of background knowledge to help me get the full picture of what I was reading and that has gotten me excited!!! While reading Luke chapter 3 and answering the questions I further learned: God had promised Adam, Abraham, Judah, Jesse and David that the Messiah would be one of their descendants and in Matthew 1:1-17 and Luke 3:23-38 God fulfills these promises. 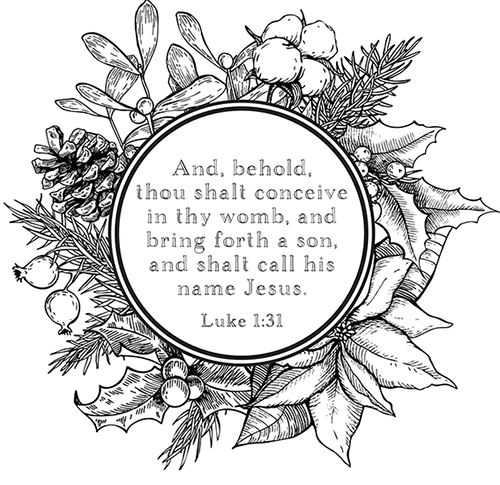 [Matthew recorded Joseph’s lineage and Luke recorded Mary’s lineage] additionally, the virgin birth of Jesus Christ addressed the curse God had pronounced on Jehoiakim (Jeremiah 36:1-32). By Joseph, Jesus had legal claim to the throne of David. The virgin birth also maintained the integrity of the curse because Jesus was not one of Jehoiakim’s offspring. God ALWAYS has everything worked out!! The wonders of God and His perfect plan gives me encouragement when I start to lose hope especially now with the country in the state that it is in. He tells us to fear not and to follow Him and if we obey his words, our faith is like a house built on solid rock!! Thank you for the coloring page. I am starting late…in chapter 1 I notice that Mary is Elizabeth’s cousin, who is a Levite, which means that Mary would be of the line of Levi as well. Does anyone know the actual geneology of Mary? I find it interesting that Jesus was considered of the line of Judah because of Joseph even though he wasn’t His biological father.